Wisconsin Rapids, WI – Fey Printing, a full-service commercial printing company celebrating 85 years in business, announces it has expanded its folder-gluer capabilities with the addition of a Brandtjen & Kluge (Kluge) OmniFold 3000. The OmniFold 3000 is a modular converting system that can be configured to fulfill the current requirements of a packaging manufacturer while simultaneously providing the flexibility to easily add modules and give the system more capability to meet future demands. Built to maximize converting capabilities while minimizing set-up time, the OmniFold 3000 includes features that bring productivity and reliability to a new level. These advancements are met with the quality and rugged durability you expect from Kluge. Fey Printing is no stranger to Kluge; they have two Kluge EHD 14 x 22 Presses and a Kluge EHG 22 x 30 Press on the floor. The new folder-gluer has allowed Fey Printing to increase production and keep more processes in-house while reducing overall project timelines. Kristopher Gasch, Director of Marketing, represents the third generation in this family-owned business. “We appreciate everything that Kluge has done to help us expand our product offerings.” he says. “It is also important to us to work with companies that have a local presence in Wisconsin. 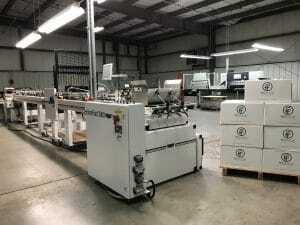 Additionally, we have found all our Kluge presses to be reliable and versatile, adapting to the changing needs and scope of our business.” These capabilities are a great option for their clients in the variety of industries that include paper manufacturing, in-store marketing, packaging, educational materials and much more. Fey Printing conducts business across the globe, offering digital printing, offset printing, specialty printing, letterpress and bindery services and a complete fulfillment center. While the company has grown and expanded, Fey Printing remains a family-owned business. They value personal relationships, and believe that every moment of service is a chance to make you smile. For more information please visit www.feyprinting.com.